Besides Japan, I have a fondness for Taiwan and its people. Hence my previous post on the difference between Taipei and Singapore when it comes to city planning. Taiwan has a problem when it comes to water conservation. If you are observant, you can find leaky water pipes when you meander along the backstreets of Taipei. Why bother fixing them when water is so cheap? How many listed local water technology companies does Taiwan have? Computer chips making the Taiwanese have beaten us; who do you think is ahead when it comes to exporting water technology internationally? The same goes for wind, solar, and other alternative sources of green energy. Their biggest fear is crude going below USD 40 again. Would you install solar panels on your roof if it costs you more in the long term? Would you switch to electric vehicles if the running costs were more than using petrol? Can make lots of jokes and noise in cyber space. But when was the last time you looked at your water bill and you wonder why its so high? Most probably its electricity costs you more interested in. Especially when you used air-con a lot the previous month. Maybe this 30% increase in water tariffs would be good in the long run? Perhaps now you would make the effort to switch off the tap while soaping? And buy taps with water saving feature installed (all IKEA taps have this feature)? Its not always about Dollars and Cents. Once upon a time, someone "threaten" to turn-off the taps during the water negotiations. Its no fun to live a life between the hammer and anvil. One don't want to sell us sand. The other likes to threaten to turn-off the tap. Must thank them. What doesn't kill us will make us stronger. Singapore does not have natural resources. But if we know how to turn "longkang" (drain) water and sea water into potable water, we now have a "resource" we can sell to the world. And we won't go thirsty. Sometimes we need to spend the necessary money and resources to invest in what's important for us. Take the case of SMRT. Once upon a time, other countries were learning from us how to design and build a world class transport infrastructure. Now we have to learn from other countries on sharpening our saw. No, water is too important to make the same mistake twice. This morning, 2 young guys showed an IT dinosaur (that would be me) what a Personal Finance Management App is all about. You can consolidate all your banking and credit card accounts into a single mobile platform and have a clear overview on your liquid net worth in your palm. Remember some bloggers were talking about personal Cash Flows recently? Well, this app is oredi one step ahead! Whether you are cash flow positive or negative every month, which spending category you have spent your money on (wine, women, or song), its all there! Warning: Those who can't handle the truth better don't download this app. I don't think you need me to remind you only use this app in the sanctuary of the toilet if you are married. If your wife sees you spending a lot of $$$ at Orchard Towers... Hey! Don't look at me! Talk so much forgot to introduce this app. Go ahead. Click on the link and it will take you directly to their website. From there, own time; own target. Its a young start-up run by 4.5 persons. That 0.5 person is a part-timer; not a hobbit. You want to know the magic word? How to have youthful looking skin? Ultraviolet light is the culprit. Just look at your underarm or your inner thigh. Skin there baby soft and smooth right? Now imagine that could be your face if you just stay out of the sun! No need laser or botox. No need SKII or facial masks. No need take antioxidant or collagen pills. Just carry a brolly and use it! Don't say this watering-hole is just a sausage fest. I got take care of the women here, you know? I can write Cosmopolitan too! Wink. Have you been to Taipei? I love it! I'm a city walker. I enjoying getting lost in the side and back streets of Taipei! Some of my Singaporean colleagues hate it though... Not used to it. I still remember my first business trip there. When I walk down the street near my hotel, I see residential apartment blocks mixed in with office buildings, over here there's a car repair shop, next to it some eateries, then further down more workshops, and lo and behold, a small night market hidden from the main road! Eh... What happen to zoning and urban planning? In case you not aware, Taipei is one of the star example if you want to find a city that has "grown" organically bottom-up to suit the needs of the city dwellers. Singapore of course is the opposite. We take pride in our cookie-cutter top down urban planning where no hair is ever misplaced. Everything is planned years in advanced. Those interested can take a look at URA's Master Plans for the future. When it comes to Singapore shopping centres, I am impressed by those that are managed by CapitaLand. Why even in Shanghai, the Raffles City Shanghai opposite People's Square is now a landmark there. Makes me feel at "home" during my 4 years there. It shows the power of top-down centrally planned mall management - when it works! Of course, there are poor poseurs for mall management at some of our shopping centres. We know it immediately when we enter. Something feels off..
Then there are the strata-titled shopping centres. Some are doing well; some suffering badly. Let's take Queensway Shopping Centre in my backyard. Its still thriving all these years! Despite having no anchor tenant and no being able to chose your tenant mix. Everything is like pot-luck! It's not top-down centrally planned, but organically grown bottom-up a bit like Taipei city. However, if we look at Holland Village Shopping Centre, another strata-titled mall, things are not looking so rosy..
You fill in the blank yourself. 1/3 of my pageviews all fake! For those of you using Blogger to blog, do you face the same problem? Guess from which countries are the top ranked when it comes to my readership? And one some days, USA. Power right? I have an international readership despite writing in my colloquial Singlish style and Chinese. Look ma! I or-yi-or Tarzan (泰山) or what? Of course these are from those spammers or something. All fake readership lah! Don't look at me; I've no clue how to stop them. That's why its always good to have a counter-balance KPI measurement to keep us honest. I have another free StatCounter to track my readership as somehow its able to filter out and not count visitors from "strange" countries. Imagine I'm a "bei kambing" buyer of advertorials or ad spaces in new media. Bloggers print screen their readership and pageview statistics I believe. I toad or what? But if I know what I know, since I'm an "insider" as a blogger myself, do you think I know better to look beyond the numbers and ask for "trust but verify" re-confirmations? If you are a fundamental investor, have you found yourself scratching your head when you "analyse" the numbers, the market price somehow don't move accordingly? Like no logic one? Bad numbers; price goes up. Good numbers; price goes down. Want to bet these companies you analysing are in sectors you have never worked in or no clue about? But when it comes to banking counters, you are super good at CSI. You know instinctively which rock to turnover! Have you come across some forum members or bloggers who are very sharp when it comes avoiding certain listed counters despite seemingly great numbers? When shipping trusts were first introduced, they offered a higher yield than REITs to entice yield hogs to bite. Of course when you make an IPO, you put your best foot forward. At this Valuebuddies forum, there were some sane voices who "warned" others on the sustainability of their business models. I myself was acting Transport Manager for a time, and working in Supply Chain, I am in close contact with my shipping counterparts whom we have lots of exhilarating "battles" - I want shorter leadtimes, more carrier choices, and fewer stop-overs; transport focus on cost savings and fewer optionality. Luckily, despite the then yield of 8-9%, I pass on Shipping Trusts. See? So what if we call ourselves "investors"? If we can't read beyond the numbers, or ask the right "trust but verify" questions, how are you any different from a gambler? Invest - risk capital to capture (outsized) capital gains and/or income. Saving - seeking conservative yield in return for no risk to capital (in nominal terms). Why in nominal terms? Well, if you include inflation adjusted returns, it gets us no where since you and I know the CPI is just a statistical index. What we chose to include and exclude, we can manipulate it to whatever we want to show. For eg, if CPI shows inflation is 3.5%, then voluntarily contributing to CPF OA to get the 2.5% interest is "dumb"... When it isn't necessarily so. Especially when the more you invest, the more you lose... Ouch! I am also excluding bankruptcies to banks and insurance companies, collapse of governments, regime changes, tsunamis, earthquakes, fire and brimstone scenarios. I think you know why. This scenario is relevant when you are super rich. That's why you see the super rich spread their assets and money across different geographic jurisdictions and their wealth denominated in different currencies. Just look at the rich Indonesian tycoons. They even send different members of their family to different parts of the world. One daughter in Hong Kong, one uncle in Singapore, one nephew in New York, another cousin in London. This way, if the patriarch is jailed or purged, the business empire will carry on. Is the above invest and saving distinctions important? If you know what you're doing, then its not important. But if you are easily "sold to", then it may help to find out whether you can accept losses to your capital and seek the "right" instrument or vehicle accordingly yourself. 1. You regularly saves $2000 per month to your savings account as you are clueless to investing. However, that sweet tight skirt at the bank convinces you that you'll get a much better "interest" return if you channel that $2000 per month to a regular monthly "savings" program into the STI ETF. After all, in the loooooong term, the projected return is 8% right? Have you read in the papers some victims of scams are in their late 50s or 60s? And the amounts they have lost are in the hundreds of thousands!? You would wonder how on earth these people with some many years of life experience under their belts can be so "bei kambing"? Same goes for the big amounts of money some of our retirees have lost "investing" in properties and stocks once they have access to their CPF funds. If all of your whole adult life you have been "invested" in saving instruments and vehicles, its understandable when you have access to hundreds of thousands or even millions in your 50s or 60s, you would think you are "better" than your peers. Forgetting that money you have, but you have not built up your craftsmanship in investing all these years. The reason for starting young in investing is not the power of compounding so evocated by so many books. That's the saving route. The main reason for starting young is so that you get yourself inoculated by the slings and arrows of the investing arena. Say your REITs are under water by 20% but if you add all the dividends collected, you are breakeven. Then realise that's not the purpose of income investing - use the bricks of the eastern wall to patch the hole in the western wall? You invest to breakeven? Its much better to lose all your money in your 20s than in your 60s. The best reason to start investing early is to know yourself. Without doing, how to know whether you are cut out to be an investor? There's no shame in taking the saving route (OK, harder to impress that "chio bu" at the pub; but you'll attract the gold diggers). The majority of investors lose money. The majority of savers will have money. And now the distinction is important! I am back to mess with your head. Today, I shall illuminate the difference between investing and saving. When we invest, we tend to think in terms of windfall. Its the emotion of greed. We try not to admit it, but deep down we know it is. We also know there is a possibility of loss. Like starting a business, complete loss of our capital is real! Again, conscious or unconscious, we acknowledge this fact. The synonyms for investing are: gamble, speculate, punt, wager, bet, venture. When we save, we are not expecting fireworks, thunder, or lighting. It like planting a acorn and hope one day it will turn into the giant oak. We don't expect to lose our capital. Planting is not like going into the forest to hunt for game. Underneath the veneer of conservatism is the emotion of fear. The synonyms for saving are: preserving, conserving, keeping, safeguarding, maintenance. Voluntary contribution of CPF is saving. So is transferring of CPF OA to SA. Buying short term duration triple A rated bonds and holding them till maturity is saving. You won't lose the capital. Buying Greek bonds is investing. I don't care long or short term duration! Buying unrated corporate bonds is investing. That's why they are known as junk bonds. Lending money in peer-to-peer platforms is investing. Don't cry default when you are getting 18% yield as compensation. Or course the borrower is glad as if he would to borrow from credit card companies with no collateral down, he would be charged 25%! Make a guess where the missing 7% went? Wholelife and endowment policies are saving. You will recover the capital intact. The projected "return" is not returns as in investing returns. They are more like savings or fixed deposit interest rates. However, there's a big "but". Wholelife you must hold till 20 years and beyond, and for endowment till maturity. Its no different from bonds or voluntary contributions to CPF. The price for capital protection is you must accept your money to be "locked-up". No free lunch! Investment-linked policy is investing. Albeit one of the dumbest kind. You not only pay management fees to the investment portion, you also pay the sales commission so your agent can take that holiday to Europe. And you thought buying unit trusts from banks with a 5% sales charge was dumb! Term policy? This one is unique. Its neither saving nor investing. It's like those other sort of insurance without the Life in front. For eg, if you bought travel insurance and nothing happened during the trip, the premium you bought that travel insurance for is now money down the toilet. This is like Dirty Harry, "Do you feel lucky? Well, do you!?" Of course its investing lah! Those who bought gold at USD $1,800 per ounce as an inflation hedge is finding out the hard way what the synonyms for investing are... Not saving right? OK, this is just the foreplay. Women readers would appreciate it. Want to STANDOUT from the male office crowd? If you take a walk down Raffles Place MRT during lunch time, look at the male office crowd there. Everyone wearing the same boring business shirt, pants, and tie right? Notice some do stand out and attract your gaze? Bow ties and suspenders right? Look again. There's another more subtle trick used by corporate warriors to set them apart from the rest of the worker ant hoard. French cuffs. And cuff links. If you do not already own business shirts with French cuffs, why don't you take some of your Ang Bao money and check them out during the post Lunar New Year sales at the department stores? Of course you need to pair them with cufflinks. Check out this website: Eminence Cufflinks. On top of the existing online discount, if you enter the below discount code, you'll get an additional 10% off! Ladies, Valentine is coming. If the man in your life is already into cufflinks, you might want to surprise him (or her)? Look! 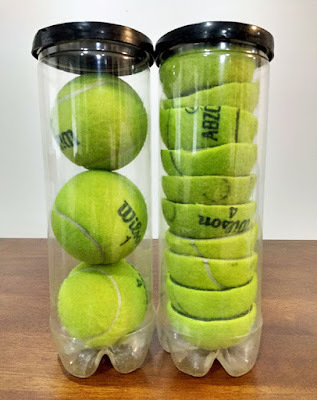 Just cut your tennis balls in half and you can save more space! Wah lah! 2) Collect air miles and fly or upgrade for free! Hello, unless your Ah Kong (corporate company) pays for the air tickets, or you charge your business expenses on your personal credit card, these air miles are not "free". 3) And then there's this come here little mouse... See the loops and hoops over there? Now jump through all of them and we'll "reward" you with a little cheese as in 1% extra interest. Tip: Try to see things from the perspective if you are the sales or marketing maverick making the above proposals to your bosses. Why throw away good margin away by offering these "incentives" to your customers? What would you say to "sell" why its in the best interests of your corporation to do so?